After joining Smart Communications’ TNT Tropang Ready training of trainers last year, faculty and students from the University of Science and Technology of Southern Philippines-National Service Training Program and Red Cross Youth conducted their own disaster preparedness training for women of Barangay Lapasan in Cagayan de Oro City. A Red Cross Youth volunteer demonstrates bandaging techniques to the women. Barangay Lapasan, which is also the university’s adopted community, is a flood-prone area, according to Dr. Maria Teresa Fajardo, USTP director for extension of community relations. “Empowering the women for disaster risk management is a means of boosting the capacity of the community to respond intelligently to any calamity,” she said. Gio Cagurin, a registered nurse and NSTP faculty, has been an advocate of disaster readiness for five years. He taught the mothers how to spot signs of dehydration and how to make a homemade Oresol solution. “Dehydration, which often follows vomiting and diarrhea, is prevalent during disasters. To save lives, it is important to know how to spot the signs and know alternative treatments,” Cagurin added. “I am happy to be here with other women and my neighbors and learning a lot from this training. 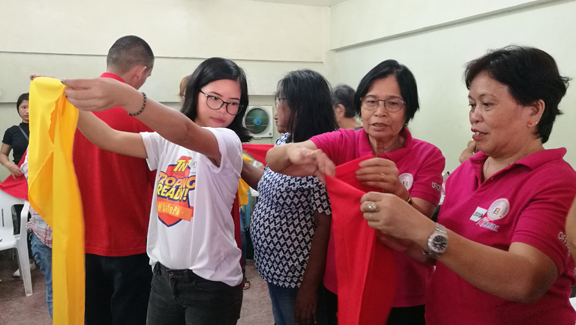 As mothers, we are normally expected to work on household chores, but this program empowers us and proves that we can do a lot more,” Quicho shared. Marivic Acut, a 57-year old who attended a disaster preparedness training for the first time, thinks it’s not too late for her to learn something new at her age. She learned the importance of an “emergency-” or “e-balde” and keeping necessary documents in a box, so she could bring them right away during evacuation.